Many noted American modernists have successfully traversed the worlds of fine art and illustration, embracing innovation while satisfying in unique and personal ways the needs and wants of a broad popular audience. The Unknown Hopper: Edward Hopper as Illustrator presents a unique and comprehensive study of the little-known twenty year illustration career of the realist master. Attitudes toward art and the crosscurrents of contemporary commercial society during the early to mid twentieth century will be explored in this exhibition, which seeks to provide an integrated understanding of Hopper’s published and personal art. The first one-person exhibition of Edward Hopper’s paintings was held in 1920 at the Whitney Studio Club, founded five years earlier by Gertrude Vanderbilt Whitney. During the early twentieth century, from about 1906 to 1925, Hopper found little support for his personal work, and earned his living by creating cover and story illustrations for American periodicals. An exceedingly private individual, he left no written reflections on his two decade career as an illustrator, but much of his work has survived in the original, as proofs, and in published form. Despite his belief that an artist’s mature development is linked to the work of his formative years, little focus has been placed on the extensive body of images that he created for such wide circulation magazines as Scribner’s Magazine, Everybody’s, and Country Gentleman, and for specialty journals like Hotel Management, The Morse Dial, and Wells Fargo Messenger. Encouraged to study illustration by his parents, who felt the field offered the potential for secure income, Hopper took courses at the Correspondence School of Illustrating and at the New York School of Art. Noted illustrator/painters Arthur Keller, Frank Vincent Du Mond, Kenneth Hayes Miller, and Robert Henri were among his teachers, and John Sloan, who worked regularly as a commercial illustrator prior to 1916, was an early influence. Though conformity to the aesthetic demands of art editors and advertising agencies was required, Hopper’s strong, dynamic illustrations for trade publications are memorable, and seemed to have engaged his interest in portrayals of reality over fictional subjects. A fully-illustrated catalogue will accompany the exhibition. Edward Hopper (1882 – 1967). Smash the Hun ( study for poster). 1918, gouache on illustration board. 9 l/2 x 6 3/8 inches. Unsigned. Whitney Museum of American Art, New York; Josephine N. Hopper Bequest 70.1455 © Heirs of Josephine N. Hopper, licensed by Whitney Museum of American Art Digital Image © Whitney Museum of American Art. Edward Hopper (1882 – 1967). Study for illustration for Eva Moore Adams “Shady”, Scribner’s Magazine, 76 (December 1924), p.627, (1924). Lithographic crayon and opaque watercolor on paper, Sheet: 29 7/8 x 21 5/8in. (75.9 x 54.9cm). Whitney Museum of American Art, New York; Josephine N. Hopper Bequest 70.1455 © Heirs of Josephine N. Hopper, licensed by Whitney Museum of American Art Digital Image © Whitney Museum of American Art. Edward Hopper (1882 – 1967). (A Theater Entrance), (1906 1910) Watercolor, brush and ink, and graphite pencil on paper, Sheet: 19 11/16 x 14 3/4in. (50 x 37.5cm) Whitney Museum of American Art, New York; Josephine N. Hopper Bequest 70.1378. © Heirs of Josephine N. Hopper, licensed by Whitney Museum of American Art Digital Image © Whitney Museum of American Art. Edward Hopper (1882 – 1967). (At the Theater), (c. 1916 1922). Brush and ink and wash, opaque watercolor and fabricated chalk on paper, Sheet: 18 1/2 x 14 7/8in. (47 x 37.8cm) Whitney Museum of American Art, New York; Josephine N. Hopper Bequest 70.1440 © Heirs of Josephine N. Hopper, licensed by Whitney Museum of American Art Digital Image © Whitney Museum of American Art. Edward Hopper (1882 – 1967). 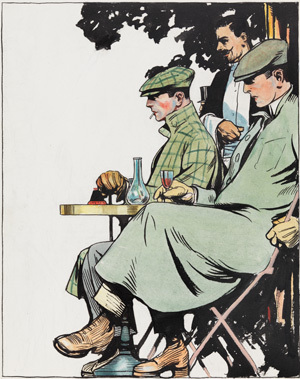 Cover illustration, Hotel Management, September 1924 Published by Ahrens Publishing Company, N.Y. © Heirs of Josephine N. Hopper, licensed by Whitney Museum of American Art. © Whitney Museum of American Art. Edward Hopper, 1882 – 1967. (Boy and Moon), (1906 1907) Pen, brush and ink, and transparent and opaque watercolor on paper, Sheet: 21 13/16 x 14 13/16in. (55.4 x 37.6cm) Whitney Museum of American Art, New York; Josephine N. Hopper Bequest 70.1349. © Heirs of Joseph N. Hopper, licensed by Whitney Museum of American Art. © Whitney Museum of American Art.